THIS is the painting visitors to the latest Anderson Trust Local Collection exhibition in Helensburgh Library in West King Street will not see. 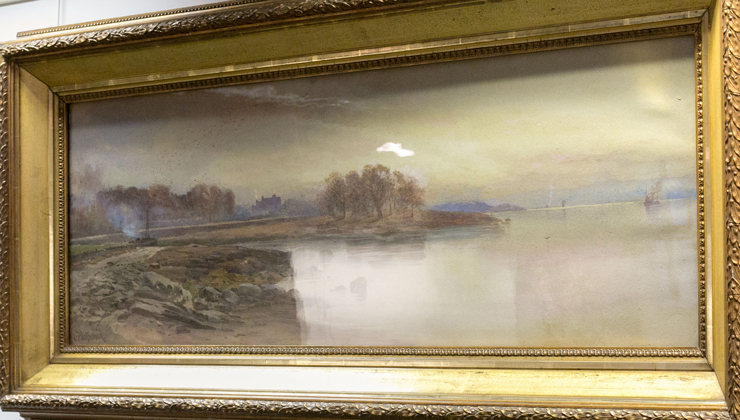 The theme of the exhibition, which is open until June, is ‘Sea Lochs and Rivers”, and it had been hoped to include this work by Rhu artist Dr Charles Blatherwick RSW (1836-95) — who featured in Eye on Millig in the autumn. But it is large and heavy and so is rarely displayed. It took three trustees and a passing member of the public to hang it. Mary-Jane Selwood of the Trust said: “Once on the wall, it caused considerable concern lest it fell and resulted in an injury. Now the Trust is considering having the painting re-framed in a lighter frame. Dr Blatherwick, who lived at Dunaivon, moved to the village about 1865 when he was appointed Chief Inspector of Alkali and Chemical Works for Scotland and Northern Ireland. A talented writer and watercolour painter, he exhibited regularly and became president of both the Royal Society of Watercolourists and Glasgow Art Club.